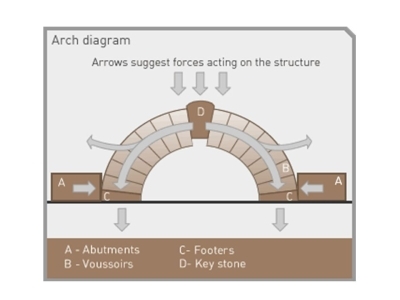 "The Physical Structure of the Kick"
the "Structure" you want to mimic is that of a "Stone Arch" but in a vertical position. The floor is one abutment to one side, the head the other one to the other side. Your Hip is the all important "Keystone". If you mimic this "physical structure" then you mimic the way it reacts to a force. In our case the opponent in front of us. Follow the path of the foot. Note that it travels a straight line to the target and back (the snapback - hikiashi). Once the leg is fully extended the "Keystone" or in this case the Hip is set in place for the duration of the impact of the Kick. 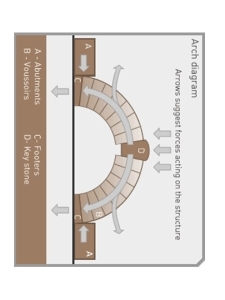 Now we have a "Vertical Arch". Strong from the front. Able to withstand the impact of the Kick. To become the "Greater Force" against the target. See in the video and feel when you practice that the floor is an abutment, your head is the other. The Arch is from your support heel to the top of your shoulders. Understand the all important hip as the keystone, put in place at the moment of full extension. The Kick starts by shifting the weight forward to balance over the support leg (variations of behind and in front of the support leg) at the same time the Kicking foot moves forward. Note that during the Kick, the Kicking leg for a moment is fully bent allowing for maximum "action space" for the Kick. But there is no stopping and the Kicking foot travels a straight line. The Kicking leg must not be overly tense during the movement of the Kick. At the moment of impact the body is contracted to set the "structure" at it's strongest. Don't forget to kick with the ball of the foot. It's very important not to lead with the head (easier to get hit by the opponent and impeding the placement of the hip) and not to stick the hip back. You will be "telegraphing" and you will not get this Stone Arch effect in your kick. Be sure not to hyperextend your leg when Kicking (more so when Kicking in "air" than hitting a pad). Now you might ask "is a Traditional Shotokan Karate Kick effective"? Done correctly . . . YES!!! We are keeping it simple here. To get the full understanding one must take a class. Strong Basics at the beginning and a good instructor is very important. More detailed explanation and videos to follow. We have just begun to revamp our website and share with you what has been handed down to us. Stay tuned we will continue this topic and talk about the position of the "support leg knee". How to utilize two different positions.